Most of us do it. We’ve been embarrassed at least once when we’re caught. Doodling in meetings or in classes is often perceived as a sign of boredom or not paying attention to the discussion. Doodlers insist, though, that it is helping them pay attention. Could doodling be something more than an outlet for restless creative energy? Working in video games, I am constantly surprised at how much we rely on communicating vast amounts of information verbally. We are a visual industry. Aside from the audio team, almost everyone is a visual content creator. So, doodling in meetings is very common in my world. After seeing Sunni Brown‘s TED Talk, I now have a new appreciation for it. 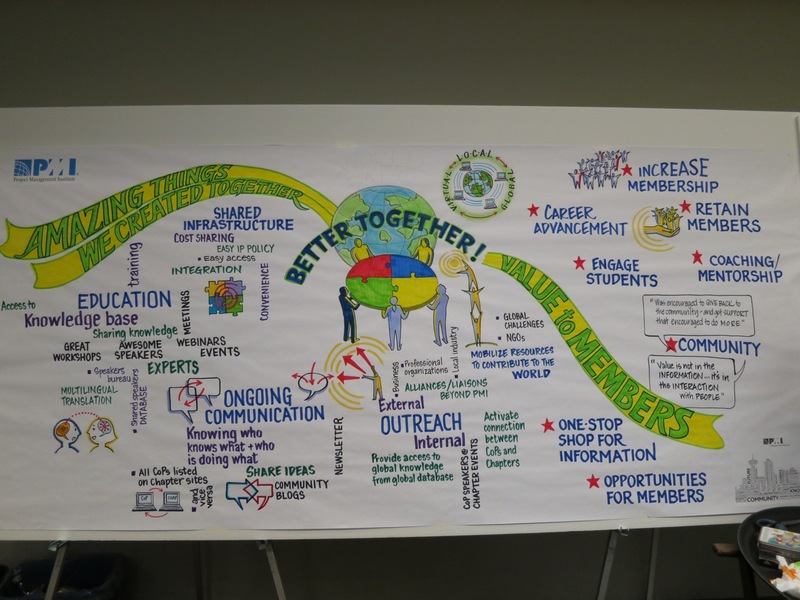 At last year’s PMI Leadership Meeting, Avril Orloff graphically recorded the ideas and discussions that came out of our various Chapter and Community of Practice meetings. The final drawings succinctly summarized information that was not always given in the most engaging or entertaining way. These were still meetings. Even watching Avril draw these throughout the meetings helped me focus more on what was going on. A year later, these drawings help me quickly recall the discussions. Do you doodle during meetings? Do they help you concentrate? Does what you doodle help you remember what was discussed? Enjoy Sunni Brown‘s TED Talk: Doodlers, Unite! If you don’t doodle now, you may be convinced to start!